SB 6406 wants to repeal Washington Civil Rights Act (I-200), promotes racial quota and preferential treatment. And it is completely wrong. Mr. John Carlson testified against the bill at the public hearing on Jan. 26, 2018. There have been plenty of evidences that preferential treatment and racial quota hurts Asian Americans’ chance in college admission, graduate school entrance, and subsequently, job and success in this country. Below are few examples. 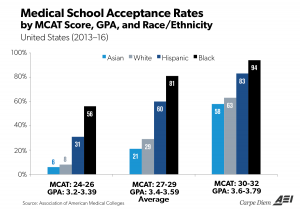 The middle set of bars in the top chart above show that for applicants to US medical schools between 2013-2016 with average GPAs (3.40 to 3.59) and average MCAT scores (27 to 29), black applicants were almost 4 times more likely to be accepted to US medical schools than Asians in that applicant pool (81.2% vs. 20.6%), and 2.8 times more likely than white applicants (81.2% vs. 29.0%). Likewise, Hispanic applicants to medical school during this period with average GPAs and MCAT scores were more than twice as likely as whites in that applicant pool to be admitted to medical school (59.5% vs. 29.0%), and nearly three times more likely than Asians (59.5% vs. 20.6%). Overall, black (81.2%) and Hispanic (59.5%) applicants with average GPAs and average MCAT scores were accepted to US medical schools between 2013 and 2016 at rates (81.2% and 59.5% respectively) much higher than the 30.6% average acceptance rate for all students (see bottom of highlighted dark blue column). Based on data from over 120,000 applicants, researchers found that “Being African American instead of white is worth an average of 230 additional SAT points on a 1600-point scale. Other things equal, Hispanic applicants gain the equivalent of 185 points. Coming from an Asian background, however, is comparable to the loss of 50 SAT points. ” In other words, Asian American students need to score 280 SAT points higher than African American students to be accepted at elite universities! If you also oppose SB 6406, please let more people know about this bill. Please also contact your district senators, house representatives, and let them know that you oppose SB6406.